Rinse and drain the black beans. Stir in the cumin and partially mash the beans. In a separate bowl, combine about 4 tsp. olive oil with the lime juice. 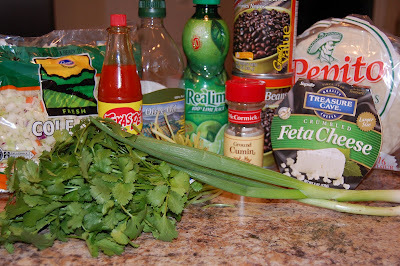 Add the cole slaw mix, green onions and cilantro and toss. Salt and pepper the slaw. Put a little olive oil in a skillet or on a griddle. 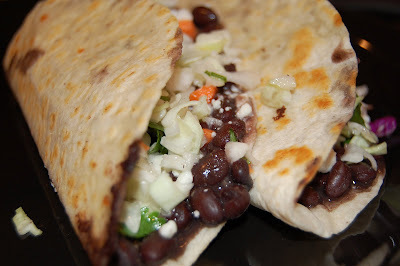 Place the tortilla on the hot griddle and add some of the black beans. Fold the shell over the top of the beans and toast on both sides until crisped. Remove from the griddle and add some feta cheese and slaw. Serve with hot sauce. My husband and I really liked these. 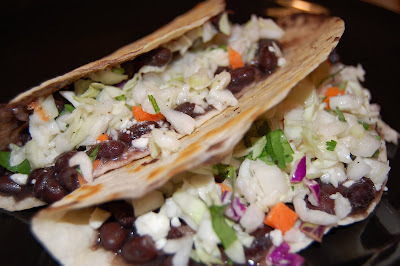 My two youngest kids ate plain black bean tacos with no slaw. My oldest daughter thought these tasted okay. My meat-loving son choked down half of one. For a quick meal, it was pretty good and I would make it again, maybe adding more spices to the beans. I also think that leftover shredded pork would be good in them. ooooh this looks delish! we are adding this to this weeks menu! thank you for sharing! I made these tonight and took your advice of adding more seasoning . I used some homemade taco seasoning. They came out great. Super easy. Very tasty (that feta adds that extra deliciousness). Thanks for sharing!